One thing I am paying attention to while riding around Houston are parks and playgrounds--how many there are, how well they are designed, how useful and accessible they are, and who uses them. (For example, James Bute Park seems mainly to be used by bums--which might be the best possible use for that particular park.) I'm interested in the aesthetics of Houston, so I'm especially interested in public spaces that are artistically engaging. 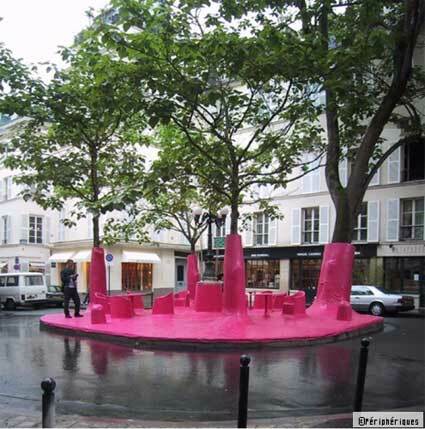 Pink Ghost in Paris by Périphériques. This kind of thing is what I'd like to see! Especially in those various bits of oddly shaped, non-functional pieces of public property. Steve Raddick. commissioner of Harris County precinct 3, has active in making these odd pieces of land into little playgrounds and vest-pocket parks--which is a great first step. But what would be cool would be for him and other county commissioners and city officials to access the artistic and architectural minds in Houston to push the playground, the vest-pocket park beyond. What is the practical purpose of having something Pink Ghost or City Lounge? Well, on the face of it, there is no particular practical purpose. But if a park or playground is unique and beautiful, it can become a locus of pride in a neighborhood. People in that neighborhood will know that this is something that sets them apart from all other neighborhoods in Houston. Since Houston lacks lots of distinguishing physical features, it's going to be man-made things that help define a neighborhood. But really, we should think about playgrounds and small parks this way because it's cool to make cool things. City Lounge in St. Gallen, Switzerland by artist Pipilotti Rist and the Carlos Martinez architectural firm. Oh course, I have only just started my systematic exploration of Houston, street by street. So we may already have public spaces every bit as cool as these, waiting for me to discover them. I hope so. These photos came from art blog We Make Money Not Art in a review of Ground-Up City: Play as a Design Tool.